Senator Rick Horner (R-Nash, Johnston): Former School Board Chair; Chairs Senate Education/Higher Education committee; Member of Senate Appropriations on Education/Higher Education committee, Joint Task Force on Education Finance Reform, and Joint Education Oversight committee. 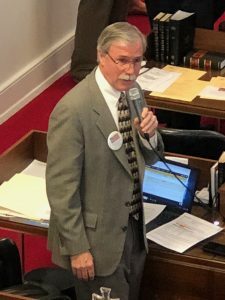 Representative Kevin Corbin (R- Macon, Cherokee, Clay, Graham): Former School Board Chair; House Deputy Majority Whip; Member of House Education K-12 committee and Joint Task Force on Education Finance Reform. Representative Ashton Clemmons (D-Guilford): Former Principal and Assistant Superintendent; House Democratic Freshman Co-Chair; Member of House Education K-12 committee, House Education Universities committee, and House Committee on School Safety. Senator Don Davis (D-Greene, Pitt): Member of Senate Education/Higher Education committee and Appropriations on Education/Higher Education committee. This bill would require DPI to develop a system that would evaluate the Exceptional Children Division’s technical assistance and support programs that it provides to LEAs. This bill would modify the definition of a low-performing school to not include a school that earned a growth score of “met expected growth”. This bill would delete the requirement that an individual appointed to represent a LEA with a high concentration of military children be an attorney. This bill would combine the career and college readiness indicators used in school performance grades, in compliance with federal law. This bill would broaden the charter school enrollment sibling priority to include siblings who apply to a charter school for admission beginning in the same school year, but one sibling was not initially admitted due to grade level capacity. The bill would also broaden the definition of full-time employee to include contract employees for the 15% priority enrollment of the school’s board of directors and employees. This bill would extend the current study on regional schools and clarify the transportation requirements for participating units to require transportation to be substantially similar to the transportation provided to students in the 2018-19 school year. This bill would revise education reporting requirements to include development and implementation of policies related to improving outcomes for students with disabilities and the implementation of high school diploma endorsements. The bill would also require LEAs to report the start and end dates for the instructional calendar by April 1 of each year. As reported last week, this bill would redirect approximately $37 million of the $47 million allotment for Classroom Materials/Instructional Supplies/Equipment. This $37 million would be used to reimburse teachers up to $400 for purchasing their own classroom supplies. WS/Forsyth School Board Vice Chair, Barbara Burke, told committee members that the local school board opposed the effort to stagger terms by a 6-3 margin. The committee vote was a 10-10 tie. As a result, HB 490 failed to pass out of State and Local Government. It currently remains in that committee and is eligible to be heard again. The Governor’s Commission on Access to Sound Basic Education discussed the community school model, statewide assessment and accountability systems, the history of NC school turnaround efforts, and statewide regional support structure. Jessica Cardichon of the Learning Policy Institute presented to committee members five opportunity indicators that should be utilized in an accountability assessment: suspension rates, school climate, chronic absenteeism, extended-year graduation rates, and college-and-career readiness. Cardichon emphasized the strong correlation between school climate and teacher/principal retention rates, which also affects student’s social and emotional development. Commission members were left with the proposed goal to ensure that improvement across all indictors is monitored and to use this improvement data to inform future school growth and funding decisions. Director of Leadership Program at NC State, Dr. Pat Ashley, presented an extensive history of school transformation in North Carolina. She explained how multiple school turnaround initiatives often have competing components, which cause them to be less effective. Dr. Ashely also highlighted the importance of having a strong and effective principal in place. Without leadership that is able to gain support, turnaround models usually end quickly. Click here to access all agenda items and presentation resources.